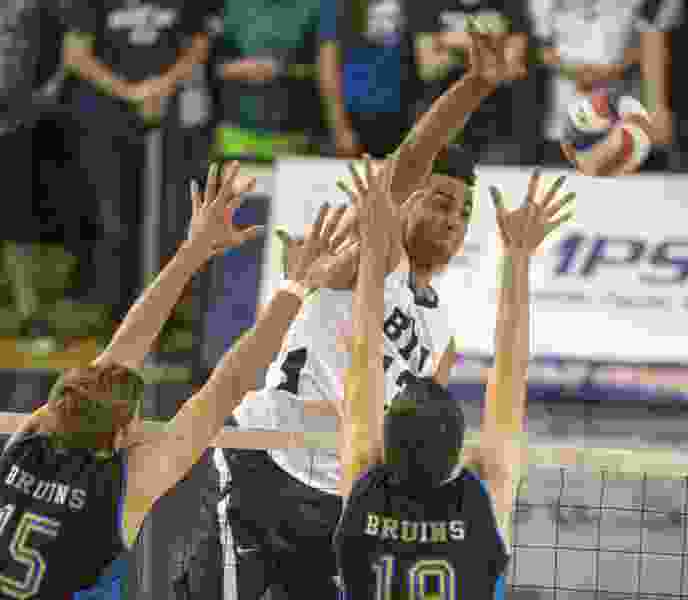 Rick Egan | The Salt Lake Tribune Brigham Young Cougars Ben Patch (13) hits the ball past UCLA Bruins Jake Arnitz (15) and UCLA Bruins Eric Sprague (19), in the Mountain Pacific Sports Federation Volleyball Championship game, in tournament action at the Smith Field House in Provo, Saturday, April 23, 2016. State College, Pa. • Brigham Young University fans outnumbered all of the other teams' fans at Rec Hall on Thursday night at the NCAA national men's volleyball semifinals as LDS Church members from the East Coast and families of several players made the trek to central Pennsylvania. A local reporter asked the Cougars Friday if they were surprised by their large showing of fans. "We get that everywhere, so we are kind of used to that," junior Jake Langlois said. "It is awesome." Sophomore Ben Patch added that it wasn't unexpected. "It is humbling, really, to have such great support where ever you go," he said. "It is like a family affair. With BYU, you are coming to play a whole family instead of just a volleyball team." After Ohio State beat UCLA in a thrilling five-set match to advance to Saturday's final against BYU, Buckeye fans took to social media, mentioning how large BYU's contingent was and that their fans should get here fast. BYU setter Leo Durkin said BYU already did that. "Whoever is doing marketing at BYU, or social media at BYU, deserves a pat on the back," he said. "Because BYU fans flock from [everywhere]. This is my first year on the road, and it just feels like we don't play an away game. A big shout-out to all the BYU fans - and please come out here Saturday." Fresh off their convincing 3-1 win over Long Beach State in Thursday's semifinal match, the Cougars returned to Rec Hall on Friday morning for another light practice and a news conference that was considerably more serious than Wednesday's. Still, the Cougars looked loose and carefree in the practice, and said they are confident, but not cocky, heading into Saturday's championship match against Ohio State (6 p.m. MDT, ESPN2). Both teams are hot, with No. 3 seed OSU having won 22-straight matches, including Thursday's 3-2 win over No. 2 UCLA, and No. 1 BYU having won 10 straight. "We are just excited. I am excited for the guys," said BYU coach Shawn Olmstead. "They have put in a lot of work, as has each team to be here at this point in the season, and to be playing in this match. We are excited to be a part of it." The Cougars had players Ben Patch, Jake Langlois appear at the news conference. "Honestly, we just like having fun. Jake's over there laughing all the time," Patch said, describing the practice. "That's how it is on the court. Volleyball is a fun game. You can't take it too seriously." Patch, a sophomore, played in the 2013 championship match before going on a mission to Columbus, Ohio, of all places. The Cougars lost 3-0 to UC Irvine at UCLA, but he remembers the experience positively. "I have just learned that every single volleyball game is just another game," he said. "I think I am going to approach it like how I approached the game yesterday, or a game in the regular season. It is just another volleyball game." Olmstead also has championship match experience, having been a libero on the last BYU team to win a national championship in any sport, the 2004 men's team. He also coached the BYU women's team to its remarkable run in 2014, which ended in a 3-0 loss to Penn State in the championship match at Oklahoma City.